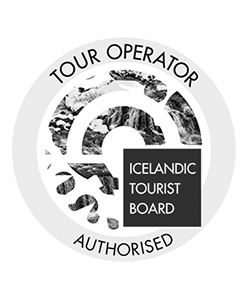 The perfect tour for those that want to dive in Silfra fissure in Iceland and need a dry suit certification! 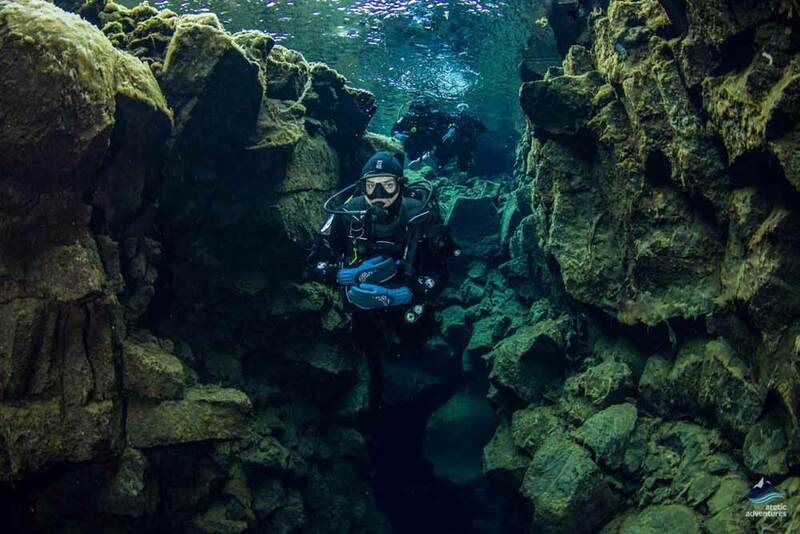 Do you want to dive the famous Silfra fissure, but are not yet dry suit certified? 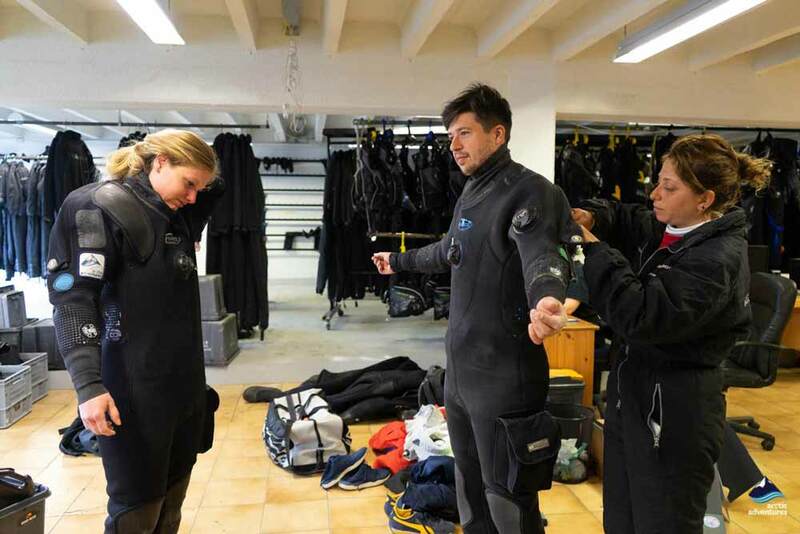 During this 2-day package, you’ll complete your dry suit training on day one, and get to dive the fantastic Silfra on the second day. Join us on this adventure and experience diving in some of the clearest water on earth! 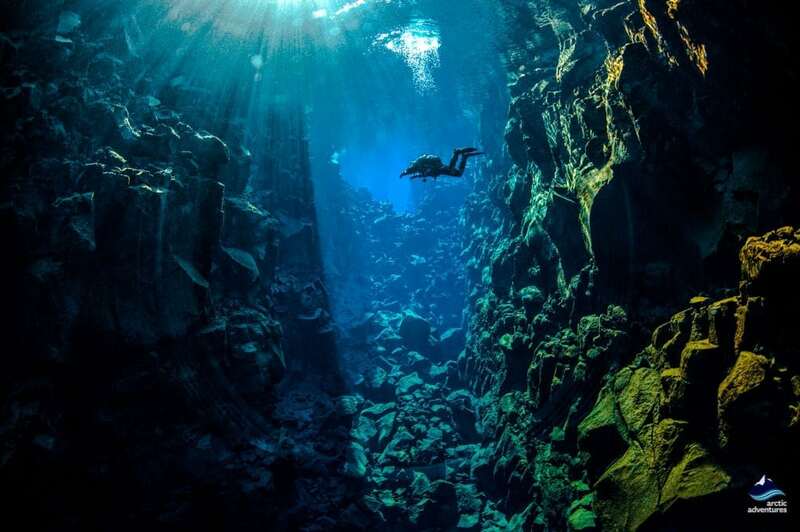 A small ravine situated beneath the iconic Thingvellir National Park, the Silfra Fissure is consistently rated as one of the best diving sites in the world. It is famous for the crystalline glacial waters, which allows divers to see more than 100 meters in each direction and the beautiful emerald plants that populate the fascinating rocks below. It is part of the Mid-Atlantic Ridge, which cuts through Iceland and marks the spot where Europe ends and America begins. 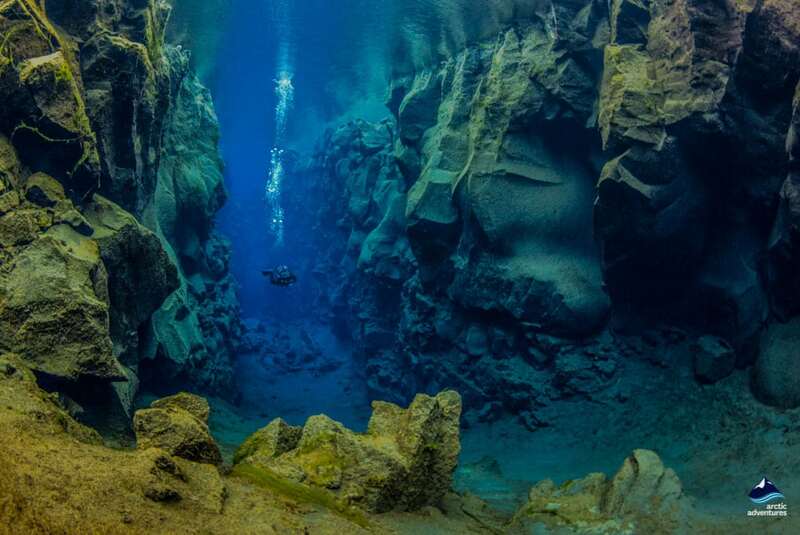 This means that in the Silfra Fissure you will literally swimming between the Eurasian and North American tectonic plates. The glacial water of Silfra is so clean and pure that you can take a small drink of it before you dive down into its gorgeous blue depths. The dive begins via a small steel ladder: when you enter you will be fully insulated in your dry-suit, although it may take a second for your face to get used to the temperature. Then as we explore this majestic turquoise world, you will get a profound sense of the beauty that nature creates. 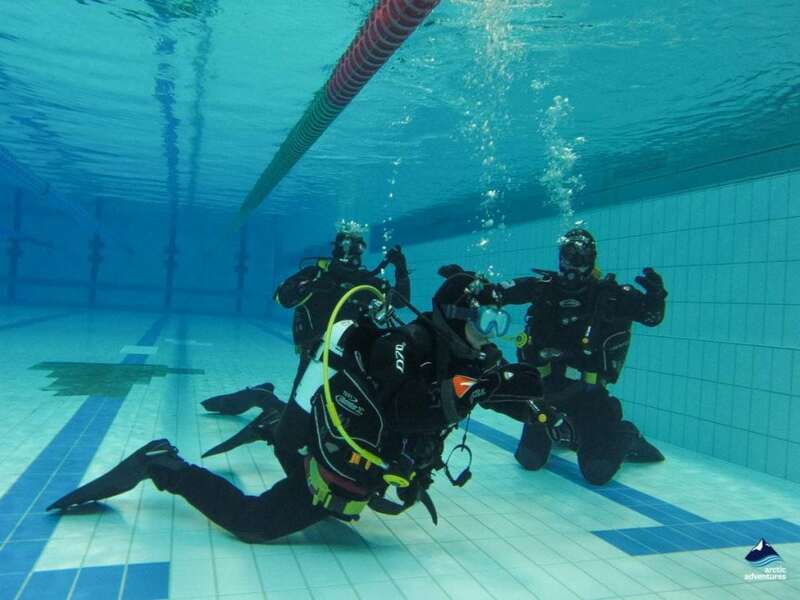 The dive itself is divided into four parts: The Silfra Deep Crack, the Silfra Hall, the Silfra Cathedral and the Silfra Lagoon. The most famous of these is the lagoon, where the water stretches into the distance and divers can see more than 100 meters in each direction. 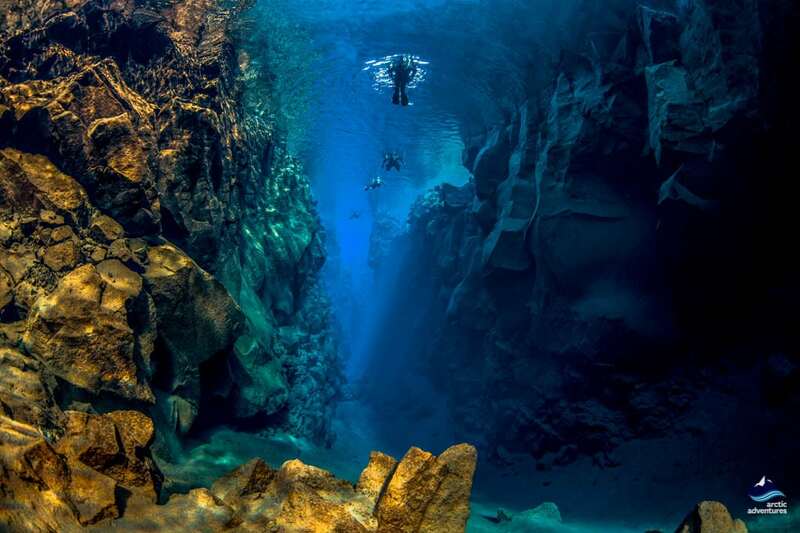 Silfra is a diving site that inspires awe and wonder in equal measure, the ideal place to have an unforgettable experience, which will whet your appetite for the sport and leave you wanting more. 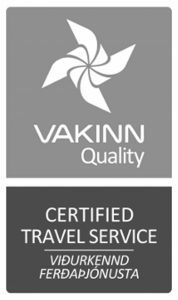 Pick-up: You will be picked up in Reykjavík, the pick-up time is at 08:00 AM. Picking everyone up can take up to 30 minutes, your patience is greatly appreciated! 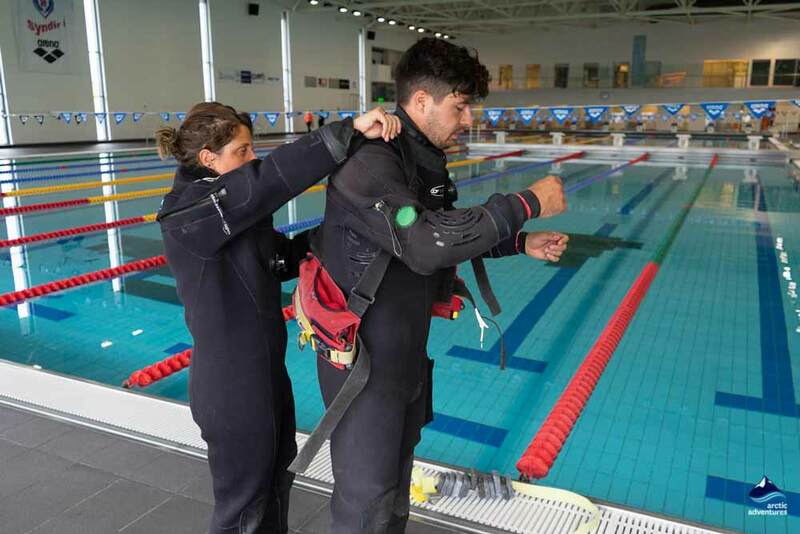 The first day of the tour is all about learning, as our expert diving instructors teach you how to safely dive in a PADI Dry Suit. In the morning we will be in the classroom, where we will learn about diving theory, how to communicate underwater and how to manage your equipment. The afternoon will be spent in a local Reykjavik swimming pool, where you can practice being underwater and test all the new knowledge that you have gained followed by two open water training dives. 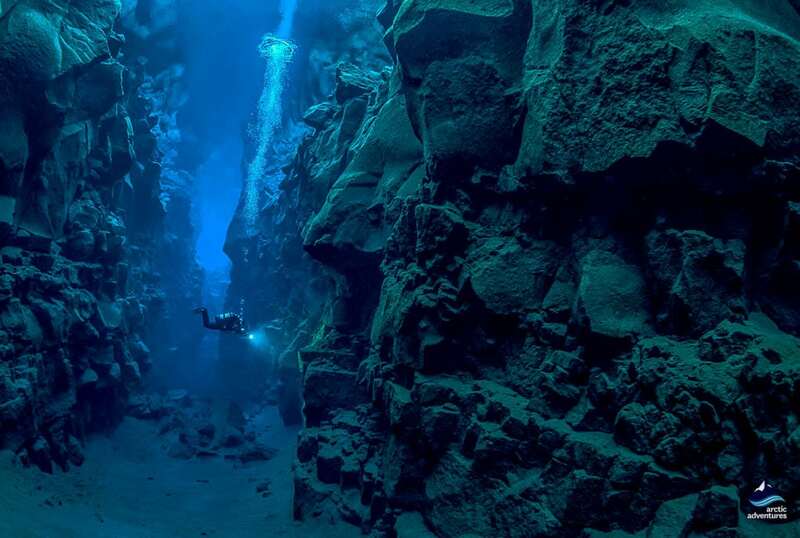 These two dives take place in a lake or protected ocean site in the Reykjavik area depending on the weather conditions. We often go to the ocean, Lake Kleifarvatn or Lake Thingvallavatn, all amazing places to test our diving skills. 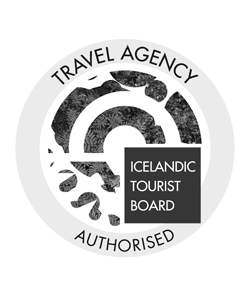 Day two is when all the action happens, as we make the scenic journey to Thingvellir National Park, to go on two guided dives on the magical turquoise world of the Silfra Fissure. There is no better way to put your newly gained diving skills to the test than in this spectacular underwater world, renowned for being one of the top 10 dive sites in the world. 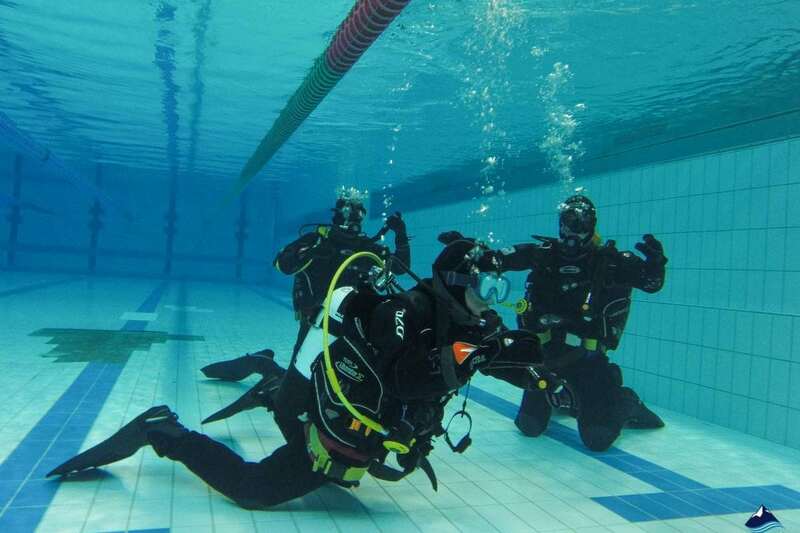 All relevant information for the tour can be found in our diving handbook. Can I bring my camera on my diving tour? 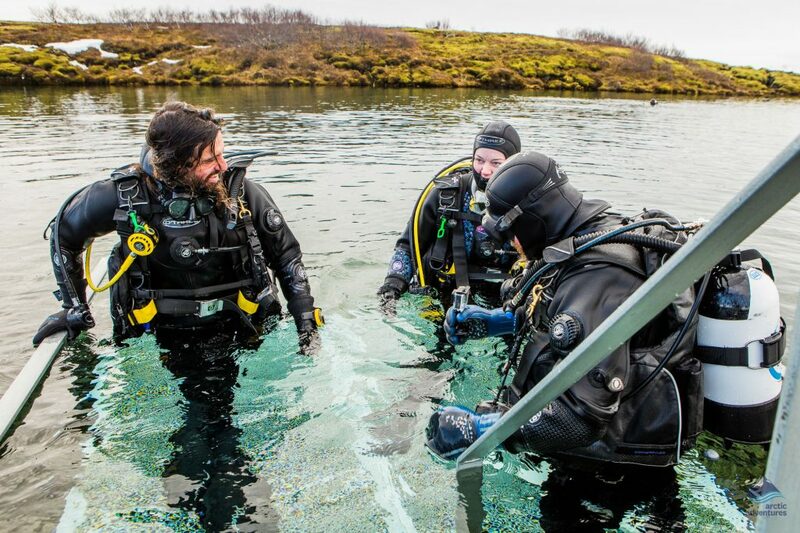 Where is the meeting point for the diving tours at Þingvellir national park? Some snorkeling tours match with a dive tour, and then you will be in the same area at the same time. You will, however, be in separate groups with separate guides, and won’t be in the water exactly at the same time. I am pregnant, can I participate in the diving tour? You are not able to participate in the diving tour if you are pregnant. 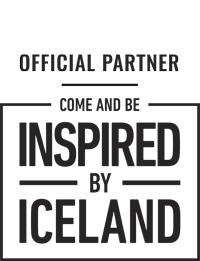 Yes, it is important that you can both understand and communicate in English in order to participate in the tour. 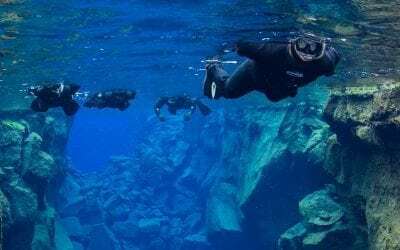 What are the requirements for diving in Silfra? The age limit for diving Silfra is 18 years old. We also recommend that you are physically fit and healthy. Because of the dry suit sizes, there are height-weight limitations. The minimum height is 155 cm, and the minimum weight is 50 kg. The maximum height is 200 cm, and the maximum weight is 120 kg. 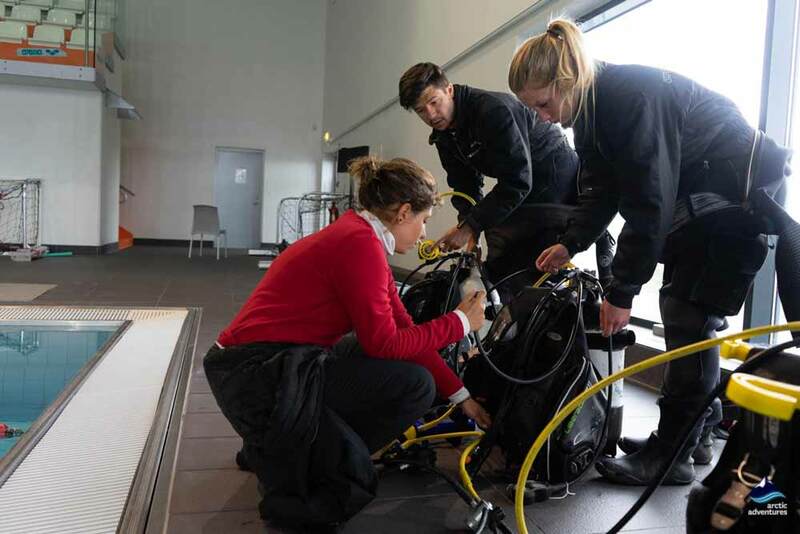 You also need to be able to carry your full dive gear for about 250 meters. 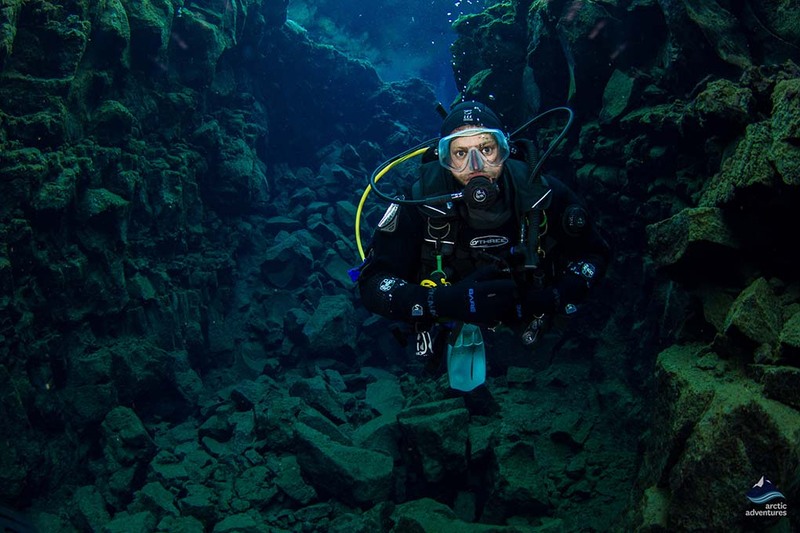 What are the requirements to dive Silfra? The age limit for diving Silfra is 18 years old. 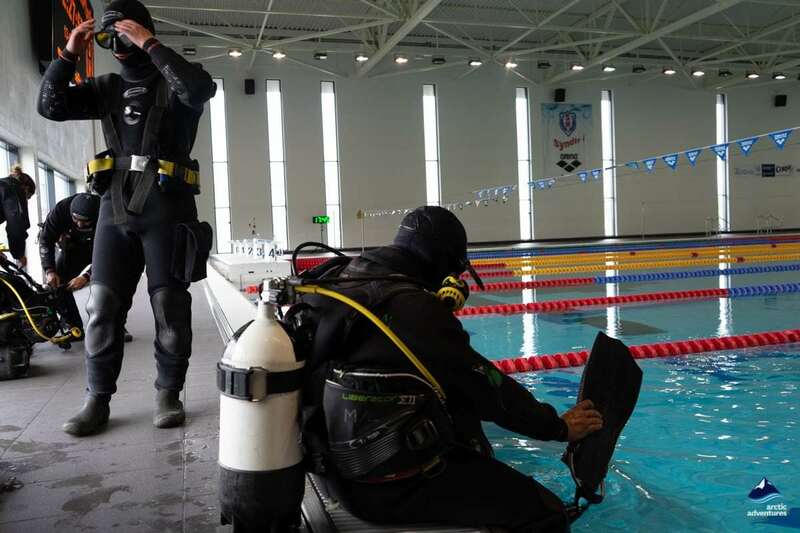 We also recommend that you are physically fit and healthy, and no smaller than 155 cm/50 kg or larger than 200 cm/120 kg, due to available dry suit sizes. 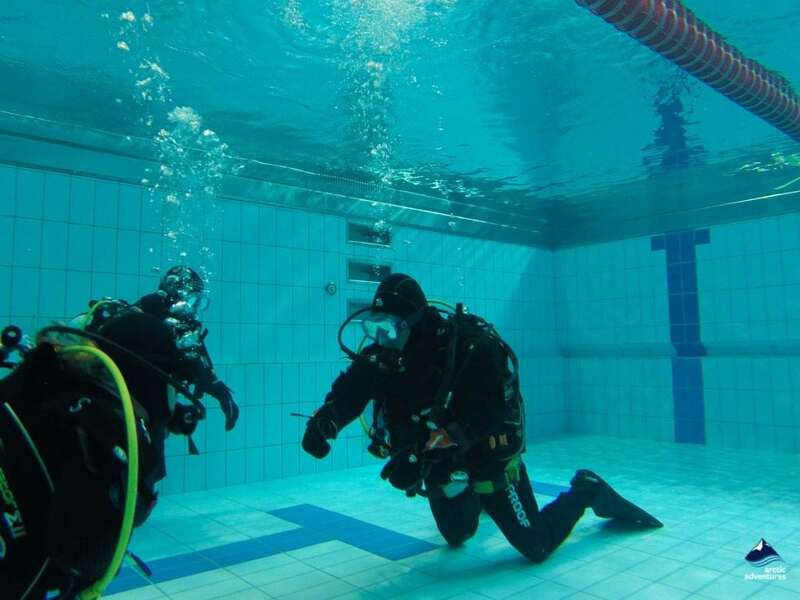 You need to be able to carry your full dive gear for about 250 meters. I am dry suit certified, but I don't have my card with me. Can I still dive? We will need to see proof of your certification. If you do not have your card, please contact us well ahead of your tour and we might be able to find you in the PADI Open Water Scuba Diver online database (if you are certified with PADI). If you come to the diving tour without your card, unfortunately, we will not be able to take you diving. Do you offer photos from diving tours? The guide will normally not take a camera on the first dive. 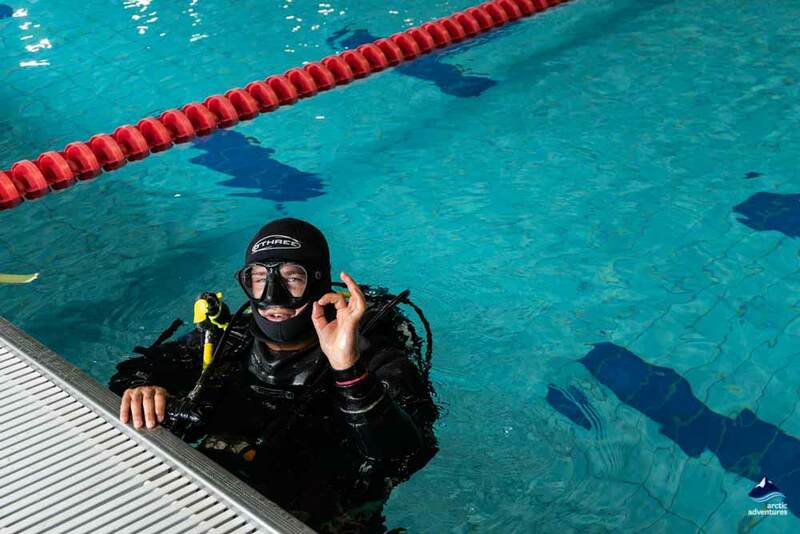 Silfra can be a challenging dive, and the guide needs to have his or her hands-free in case a diver needs assistance in the water. If everything goes well on the first dive, there is a chance that the guide will take a camera on the second dive. If photos are taken they can be purchased for 3 900 ISK in total for all photos. Talk to your guide on the day of the tour if you are interested in photos. 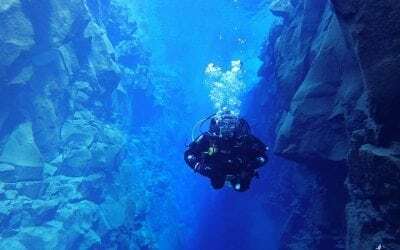 What is the depth and dive time when diving the Silfra fissure? The maximum depth we are allowed to go to in Silfra is 18 meters. Most of the dive is spent at a shallower depth due to the topography of the site. 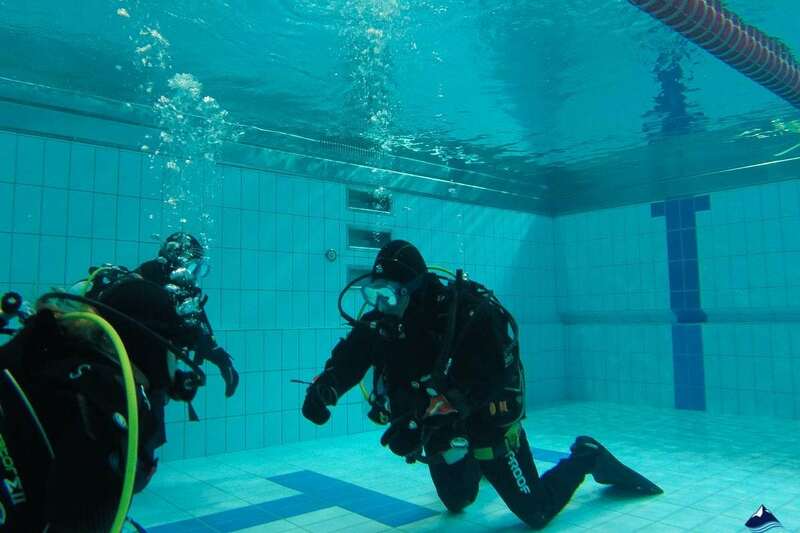 The dive time is about 30 minutes per dive. What is the water temperature in Silfra? Is the water clean in Silfra? Before reaching Silfra, the water coming from Langjokull Glacier is filtered through porous underground lava rock for 30 – 100 years! This makes it the clearest water in the world, as lava rock is an excellent filter. It also means that the water is the clearest in the world allowing for underwater visibility of over 100 m (328 ft). 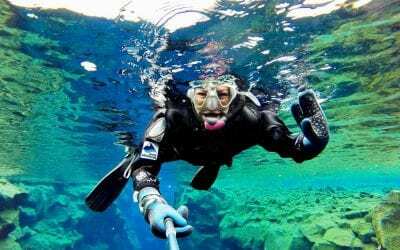 A diving tour located in beautiful surroundings at Thingvellir National Park. See for yourself why Silfra is one of the world's most unique freshwater sites! Diving doesn't get much better than this! 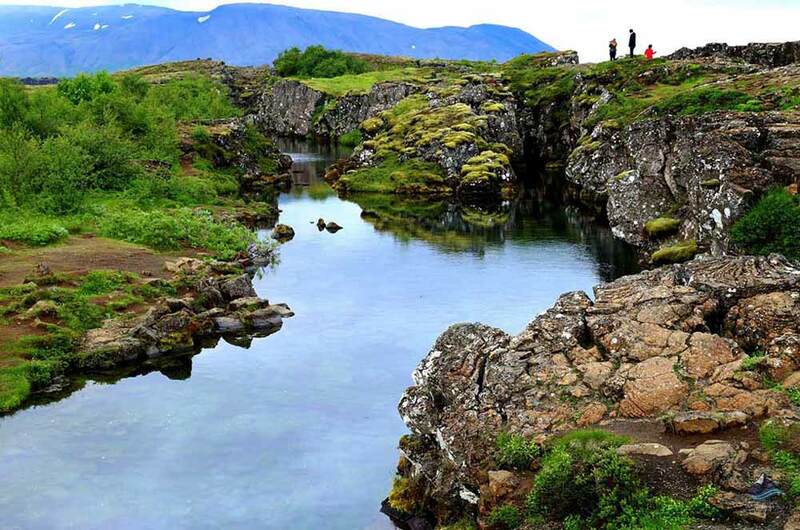 Snorkeling in Silfra Fissure in Thingvellir National Park is the perfect day tour from Reykjavik. Floating through the crystal clear water of Silfra, one of the best dive sites in the world, is something you won't forget!